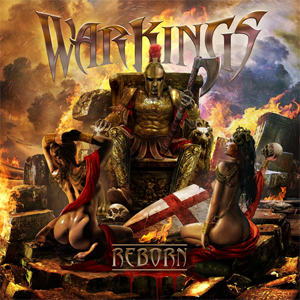 WARKINGS Release First Glorious Single, Video "Gladiator"
To all of you upstanding followers of the kings of war: Odin's ambassadors arrived on planet earth to spread the stories of ancient wars and battles! It's the Tribune who is the first to raise his voice! He is a noble leader, versatile and determined on his fight for the Roman Empire. An impressive swordsman and his war chants command the Legions on the Battlefield! The Tribune: They give us steel...we give' em blood. Morituri te salutant!!! The almighty WARKINGS just revealed "Gladiator"! "Gladiator" is a glorious glimpse of what you mortal beings will get, when the debut album Reborn will be released on November 16th. Recorded inside the endless halls of Valhalla, produced by Odin himself and mixed and mastered by our forefathers, who died honorably by the sword, this track will crush you all! Watch the official music video for "Gladiator" on KNAC.COM right HERE. For those of you, that cannot await the full transmission of Odins ambassadors and want to receive his words at first, secure your copy of Reborn right HERE. Four kings of war were knocking on Valhalla's door to spend eternity in the realms of the gods. While waiting for admission, they told each other about the heroic deeds they survived in their lifetimes. Secretly listening to their stories, Odin decided that all living human beings on the Earth should know about these true stories of war and heroism. So he is about to send them back with the mission to spread the stories of their battles upon mankind. The WARKINGS were born and pure and unadulterated heavy metal became their religion. Odin chose Napalm Records as the perfect platform for the WARKINGS to spread their stories. We were told to receive new information about these warriors every Wednesday from now on. To follow his order to spread their message, we launched the WARKINGS-Wednesday. On this day, we will bring Odin's word to the world. "Ready your breakfast and eat hearty...because we're coming for you at the WARKINGS-Wednesday"